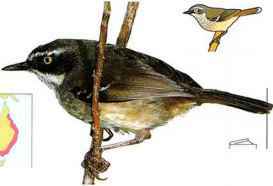 I liis bird gets its name from its association with the Superb Lyrebird (seep. 260). The larger Superb Lyrebird scratches up leaf litter in search of invertebrates, and the little Pilotbird follows to share in the feast. The I'ilotbird is often surprisingly tame and may approach a human observer within arm's reach. • NEST a large, untidy, domed nest with a side entrance, placed on the ground or in a bank. 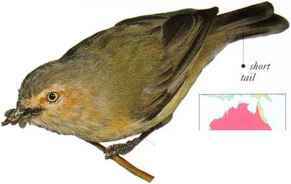 A small, brownish bird, this species is often found in dense thickets, foraging just above ground level for seeds and insects. The underside varies in color, from spotted to plain and from white to buff, according to geographical area. 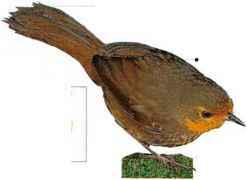 • Nest a bulky grass sphere with a side entrance, placed on the ground in undergrowth. 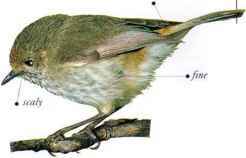 A small, insect-hunting bird with red eyes, this species is found in almost all types of woodland, usually in pairs or small parties. It forages in the undergrowth, rarely on the ground. • NEST An untidy, bulky, oval nest with a side entrance, made of grass, and placed on or near the ground.